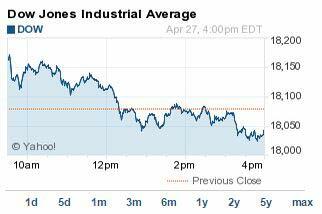 The DJIA Index fell 42 points today, while the biotech sector dragged down the Nasdaq. The S&P 500 Volatility Index (VIX), the market's fear gauge, jumped 8.62% on the day. Stock Market Recap: U.S. markets slid Monday as the Nasdaq and biotech stocks slumped overall. The Nasdaq Biotech Index (INDEX: NBI) cratered 4.1% in the sector's largest daily decline in nearly a month. On Tap Tomorrow: On Tuesday, U.S. investors will be back on "Fed Watch," as the Fed Open Market Committee kicks off a two-day meeting to discuss monetary policy. The central bank has all but ruled out a rate hike in June. Looking Abroad: Investors in Europe pushed stocks higher Monday after news broke that Greece altered its team to handle debt negotiations with international financial ministers. Spain announced plans to lift its 2015 growth outlook, announcing that its economy will expand by 2.9%. The nation, beleaguered by unemployment and significant spending, took more conservative-leaning approaches to handling its economic plight. Prime Minister Mariano Rajoy predicted nearly 500,000 new jobs and praised spending cuts, while wagging a finger at more "populist" policies in Greece. Stocks to Watch No. 1, AAPL: Shares of Apple Inc. (Nasdaq: AAPL) jumped another 1.8% this afternoon ahead of today's earnings report after the bell. The iPhone 6 may be the lone outperformer in the Q2 AAPL earnings, but some are expecting the company to outperform on its Apple Watch estimates. In addition, the company could hike its dividend by as much as 10%. For a breakdown of what to expect for AAPL's earnings report today, check out our full analysis here. Stocks to Watch No. 2, TSLA: Shares of Tesla Motor Co. (Nasdaq: TSLA) jumped more than 7% intraday on positive comments from analysts at Deutsche Bank and Credit Suisse Group AG (NYSE ADR: CS). The analysts said the markets are significantly underestimating the power of a new product that the company will unveil this Thursday. It's a new battery – or stationary storage unit – that can power homes and businesses. Both analysts said the new battery could add significant value to the firm's share price. Stocks to Watch No. 3, AMGN: The U.S. Food and Drug Administration delivered a heavy blow to shareholders of Amgen (Nasdaq: AMGN). Shares fell 3.3% on news that the regulator has rejected the company's consideration for an accelerated review of its new skin cancer immunotherapy. The agency cited concerns about the drug's design after a critical trial. Stocks to Watch No. 4, MYL: Shares of Mylan NV (Nasdaq: MYL) slipped another 5.6% today on news that the company has rejected a $40 billion unsolicited takeover bid from rival Teva Pharmaceutical Industries Ltd. (NYSE ADR: TEVA). Mylan said the deal "grossly undervalues" the company's potential. TEVA stock fell 4.3%. Stocks to Watch No. 5, BP: The British government has told executives at BP Plc. (NYSE: BP) that it would reject any potential takeover bid by a foreign sovereign fund or international company. The government said it wishes for the multinational energy giant to remain a UK-based firm due to its immense geopolitical influence. Although the potential takeover of a $132 billion company might seem like a stretch, suppressed oil prices have driven speculation that a large company like Exxon Mobil Corp. (NYSE: XOM) could make a play given Royal Dutch Shell's (NYSE: A) recent purchase of UK-based energy giant BG Group. Stocks to Watch No. 6, DB: Following last week's $2.5 billion fine over interest rate manipulation, German financial giant Deutsche Bank AG (USA) (NYSE: DB) announced plans to overhaul its operations. Unfortunately, investors were not too thrilled. Shares fell 4.8% after the firm's co-CEO Anshu Jain said it plans to slash its balance sheet by 3.5 billion euros ($3.8 billion) in an effort to create "a "smaller, leaner more resilient bank."